Yeah, we've known about that for a while and have discussed it in IRC. Has it not been posted here before? It was discussed in the music thread. The track is used more than once in the film, however-- the full version is heard during a montage elsewhere in the film. You also hear the motif throughout the soundtrack; it's Inspector Yamashita's theme. Welp, no need for this one then, I guess. Was it just me or was Mari/Shinji's kiss scene some sort of homage to Asuka/Shinji's almost kiss in NGE episode 9? the way Mari seemed to be closing her eyes and the angle made it seem like she was lying down, sleeping while Shinji was blushing a bright red. Last edited by Eric Blair on Thu Jun 03, 2010 8:46 pm, edited 1 time in total. We watched 'The Lion King' in my math class once. After it was over, the teacher passed out worksheets that said: "If the circle of life had a diamter of 46 inches..."
The conclusion of the Zeruel fight contains an homage to episode 39 of Revolutionary Girl Utena. The decontamination process at the water treatment plan is an homage to The Andromeda Strain. The layout of various Nerv installations borrow location names from The Divine Comedy. ZapX wrote: Yeah, we've known about that for a while and have discussed it in IRC. Has it not been posted here before? Sorry for the off post, but where do you guys chat in irc? With channel/serve? Can i have the link? thanx! It's irc://irc.rizon.net/egf If you need help with registering, check out this thread. NemZ wrote: The decontamination process at the water treatment plan is an homage to The Andromeda Strain. These are not so Rebuild specific -- episodes 13 and 24 respectively. Mr. Tines wrote: These are not so Rebuild specific -- episodes 13 and 24 respectively. The Andromeda Strain's decontamination process was never referenced before and the terms from The Divine Comedy were used in a different context. I respectfully beg to disagree. Ritsuko: Not only does time progress, but the technology of EVA as well. We always need new data. * Door Opens. All three pilots are naked. Asuka: There, I'm just as you wanted--washed and cleansed seventeen times. k. Still, like The Divine Comedy, the reference is in a different context this time. And presented differently. It's been said in other threads, but I'll repeat it here. "Freedom is an illusion. All you lose is the emotion of pride. To be dominated by me is not as bad for human pride as to be dominated by others of your species." It's a quote from the cult classic sci-fi film Colossus: The Forbidden Project. The context is The speech that Colossus makes at the end of the film when he has successfully dominated humanity. Another Sci-fi reference is the number on the shuttle Gendo is in. It's FX5 1701. The FX5 is a reference to Firebal XL5. The 1701 is the number of the Enterprise. NAveryW wrote: k. Still, like The Divine Comedy, the reference is in a different context this time. And presented differently. Although the references are different, the context is still the same. I believe in 22, when Eva-00 is getting the Spear, the deeper layers of Dogma are referred to as the "Malebolge Trenches". Rebuild keeps the "Nerve is Hell" thing, but references different parts of it, which really only makes it more overt. Rebuild DOES however expand into things like bases named Golgotha, which are not references to hell. This is a new context. You can't tell from still screenshots, but these columns in the back of Ritsuko's computer room have the red dots moving left and right at varying speeds. 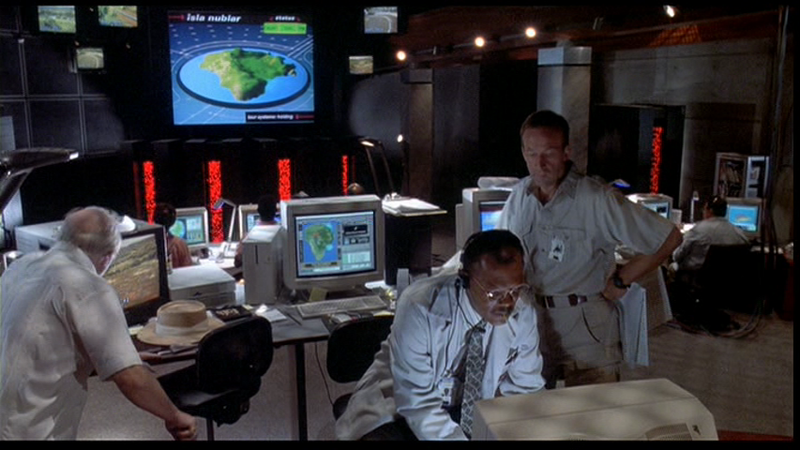 I saw Jurassic Park in a theater tonight and noticed very similar columns all over the park's control room. Not exactly the same, but still black columns with red dots moving left and right. 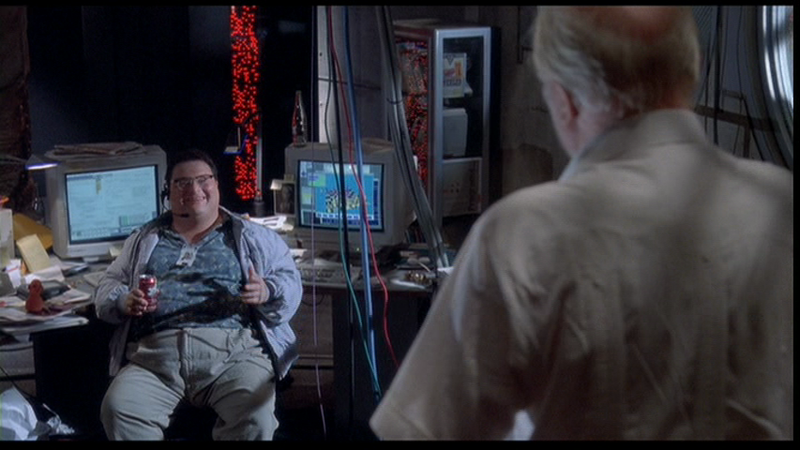 I don't own Jurassic Park on DVD, so a big thank you goes to Reichu for these screenshots. Jurassic Park is a story about scientists who create clones of ancient, often giant organisms that they think they can control but they can't. Wait, what? I just watched 2.22 recently and I don't remember that.